Your most valuable (and often untapped) market for is the one you’ve already mastered– your current customers. Not only is it possible to retarget and sell to your current customers, but it’s also faster, easier and more cost-effective than finding new ones. They’ve already made a purchase. So what? That doesn’t mean you’ve come close to tapping their lifetime value. All their status as a current customer tells you is that 90% of your job in selling to them is already done. In fact, the average customer spends more in their third year than their first. So why are you spending five times more to acquire new customers? When you acquire a new customer, the first 100 days of that relationship is crucial. You can deliver an exceptional customer experience that continues to nurture them as you cross-sell, upsell and delight them into becoming loyal lifetime customers. Or, you can watch it wither until you’re a complete stranger to your own customers. By now, your buying cycle should be a fully developed lead machine, nurturing leads throughout the entire process of purchase consideration. But once your buyers have become customers, you need a new process to tap into their lifetime value. How well do you have your customer lifecycle defined? The Impulse Creative crew can help you to increase revenue by creating an intentional plan for the entire lifecycle of your customers. We’ll start by talking to your team about what happens after someone sends you a check. Then, we’ll interview a cross-section of your customers and survey your larger customer base. With that information, we can help you to see the bigger picture of what your sales and marketing is missing, using real data. We’ll be mapping out the entire journey of your current customers, so your business can begin to understand exactly how you’re serving and retaining your most valuable asset. Then, we’ll present a plan to enhance your customer’s experience with targeted customer marketing. The core of the inbound methodology is getting the right message to the right people at the right time. Many of those “right people” are actually your current customers, not strangers. Don’t miss an easy opportunity for revenue and growth by overlooking your current customer base just because it’s not as flashy as increased traffic and leads. Reach your goals for growth faster by serving your already loyal customers with targeted marketing. Our marketing team uses the Inbound Methodology to create custom marketing materials and campaigns focused on your buyers. Explore how we do marketing better. 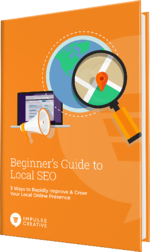 Our Beginners Guide will give you a basic understanding of local SEO by introducing you to Google My Business, On-site Optimization, and Citations & Reviews.